A wise chef once shared with me this mind-blowing bit of insider culinary information: tomatoes and strawberries are relatively interchangeable. What??? How can that be?! One is primarily used in savory dishes, and the other sweet. This changes everything. What about the space-time continuum!?!? Marty, don’t do it! It seemed just plain dangerous to mess with the mold like that, but after examples of some ingredients mutually appreciated by the two red fruits I began to open my young grasshopper eyes and see the light. 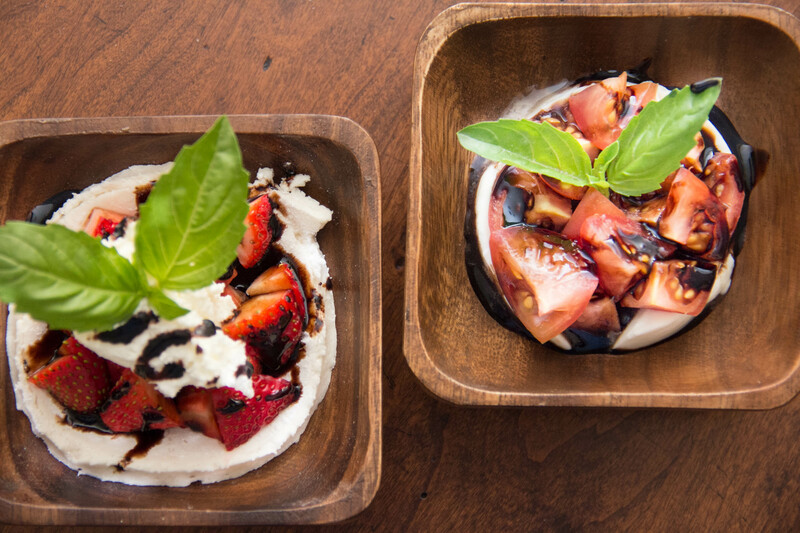 And that was the inspiration for this experiment: Caprese Two Ways. The obvious is the classic, of course. Tomatoes, mozzarella, basil, and bit of balsamic drizzle. For this go-around I used Campari tomatoes, which are a bit larger than a grape tomato but still small, juicy, and sweet. Love them. The switch-up in this attempted reinvention is that it is starring…(drum roll) The Strawberry!! 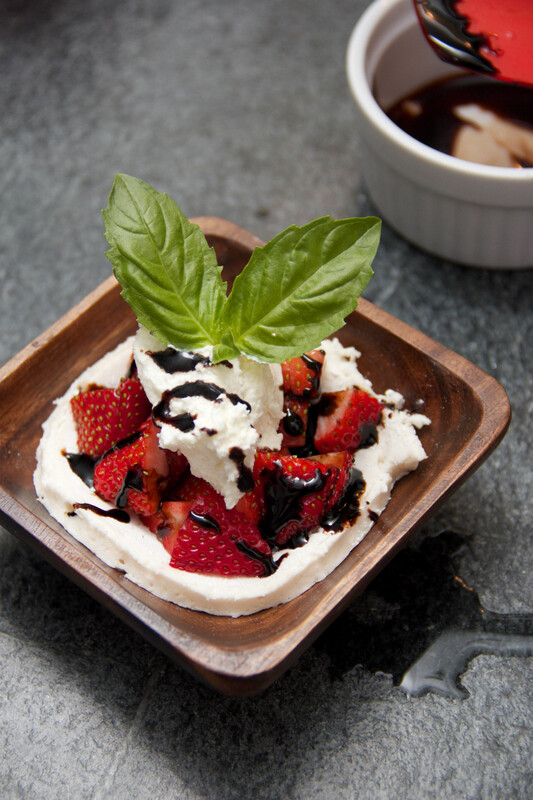 In a fit of whimsy, I went and swapped out the mozzarella for homemade marshmallow and the sprig of basil leaves in favor of a dollop of fresh basil-infused whipped cream. I know…I’m mad! Don’t try to talk me off this ledge – it ain’t gonna happen. Since it was my first stab at making marshmallows, I simply adapted the Smitten Kitchen recipe. No need to be a hero tonight and pour over the proper recipe development of the ‘mallow – that’s a later lesson. I halved the ingredients and spread it out over a 9 inch springform pan; I wanted to produce very thin marshmallows that could be cut to resemble a circle of mozzarella, rather than the thicker, more traditional blocks. I followed the recipe to a productive and very tasty end that yielded the kind of faux mo’ cheese that I needed, and then used the top of a pint glass to carve out the proper size and shape. It wasn’t even the sticky, sugary mess I’d originally been prepared for (turns out I didn’t need the poncho, gloves, or safety goggles – though I did look super cool). 12 or 13 basil leaves submerged in a half cup of heavy cream, brought to a simmer, and then left to infuse for thirty minutes or so at room temp made a perfect base for the freshest, most herbaceous whipped cream to come out of my kitchen. I made a quick balsamic reduction, and then the rest was in the assembly. 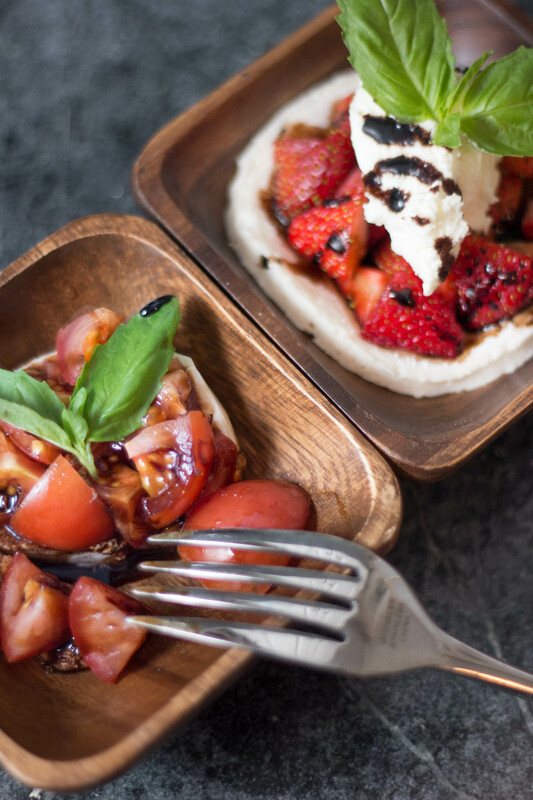 Not surprisingly, the strawberries really do share the tomato’s affinity for basil and balsamic. While the preparation was a bit different, you can really appreciate the fact that these fruits are really just family from another plant seed. So what do you do with this? Endless possibilities, my friend! Blind taste-tests! Side-by-side comparisons! 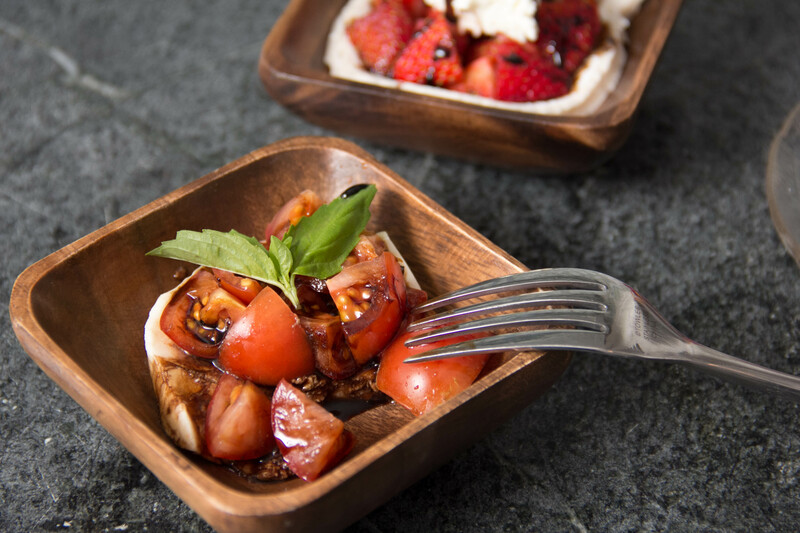 Bookend your next dinner party offering with Caprese as both the salad course and the dessert course (they’ll be so confused by the menu)! Dazzle your friends with this mind-bending flavor swap! And watch the shock and awe as you pass on this secret knowledge to another non-believer. Very interesting I didn’t know that! Those pictures are beautiful! I love this! What a creative and delicious idea!